I have an obsession with Israeli salad (cucumbers and tomatoes chopped finely with lemon and olive oil), and these chips are perfect crumbled over the top. They're also great as a dip for hummus, baba ganoush, or tzatziki. Za'atar (the green one) and sumac (the red one) are Middle Eastern spices that you may or may not be able to find in a supermarket. I got mine at the Dubai Spice Souk. I know Amazon carries both if you can't find them locally. 1. Preheat oven to 350 degrees. 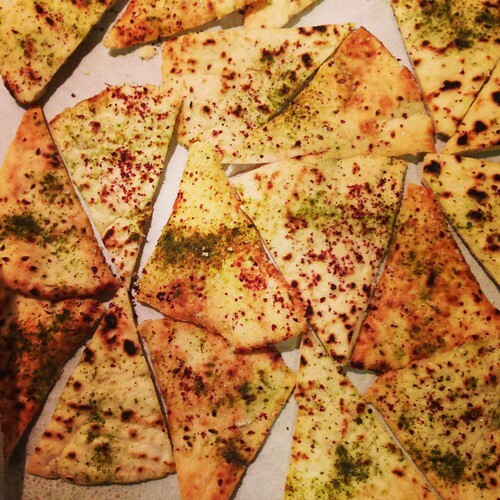 On a large baking sheet lined with parchment paper, arrange all of the pita slices so they do not overlap. 2. Either brush or spray with olive oil, then sprinkle with sea salt and your spice(s) of choice. 3. Bake for 10 to 15 minutes, or until they begin to color. Let them cool completely before using, or bagging for later.